EL PASO - If American politics has turned into a three-ring circus, this city in west Texas will hoist the Big Top on Monday, with President Donald Trump coming to rally for a border wall, Democratic wunderkind Beto O'Rourke leading a protest march and even the Trump Baby blimp putting in an appearance. O'Rourke, fresh off an interview with Oprah Winfrey, said he sees Trump's campaign rally as an opportunity for the city to take control of the narrative. "I think the president's decision to focus on El Paso and his horrible demonization and vilification of immigrants, specifically Mexican immigrants, and his desire to make us afraid of the border can work to our advantage," he tells the El Paso Times. "In other words, as he comes down here and as he referred to El Paso in his State of the Union speech, the eyes of the country are literally on us and will be even more so on Monday." 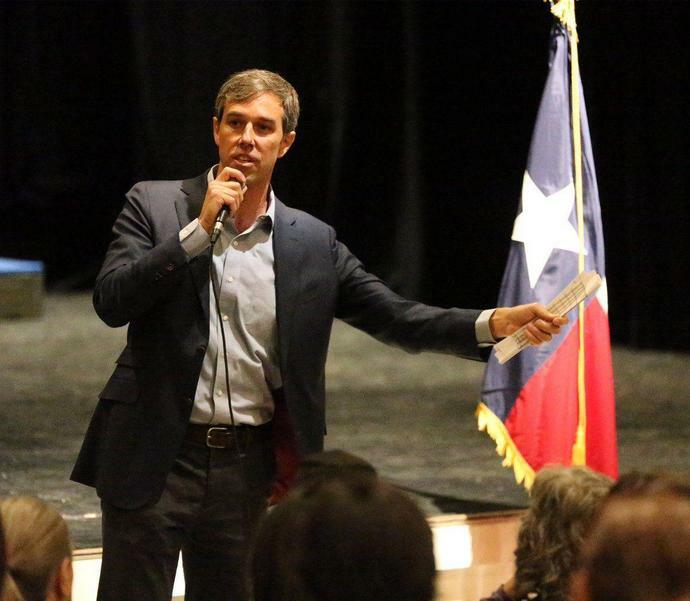 "He's offering us a chance to tell our story and we're going to take that chance, all of us," O'Rourke told the El Paso Times. O'Rourke's camp described Monday's protest march as an effort to "show the country the reality of the border - a vibrant, safe, bi-national community that proudly celebrates its culture, history, diversity and status as a city of immigrants." Today's fencing was largely constructed after the Secure Fence Act was adopted in 2006 under President George W. Bush. From 2006 to 2011 - two years before the fence was built to two years after - the number of violent crimes recorded in El Paso increased by 17 percent. In an interview in New York this week with Oprah Winfrey, O'Rourke called Trump's push for a border wall a "racist response to a problem we don't have. It seeks emotionally to connect with us, with voters - to stoke anxiety and paranoia, to win power over 'the other' on the basis of lies that vilify people."